Eduardo joined NACTO as a program manager in 2017 to contribute to GDCI’s efforts in promoting safe, equitable, and sustainable cities through better street design. As part of Bloomberg’s Initiative for Global Road Safety, he provides technical assistance to the City of Fortaleza in applying the design principles from the Global Street Design Guide. Prior to joining NACTO, Eduardo worked at SP-Urbanismo, an agency within São Paulo City Government, in Brazil, where he was involved in strategic initiatives related to urban mobility and public spaces. His experience ranges from contributing to the revision of the city’s Strategic Master Plan to managing street design projects and policies. As an urban design coordinator, he was responsible for designing and overseeing the execution of temporary street transformations in the city center (Programa Centro Aberto) and for managing the local parklets policy. He also had the opportunity to engage in several bike-related projects, which included providing urban design guidance to the city’s cycling planning division and designing the city’s first intermodal bike parking facility. Eduardo received a degree in Architecture and Urbanism from University of São Paulo – FAUUSP. He also studied for one year under an exchange program at ETS de Arquitectura de Madrid. 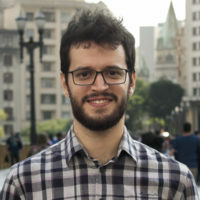 During his studies in Brazil, he joined Fluvial Metropolis Research Group and collaborated on the development of studies for a metropolitan waterway ring in São Paulo. His final thesis was based on these studies and was selected to represent FAUUSP at Archiprix International competition.